In a speech given during a visit to Berlin, Mussolini assures the world;”There are no secret intentions in my visit. Nothing is being plotted”. The last Polish resistance, the fortress of Modlin, falls after 18-day siege. 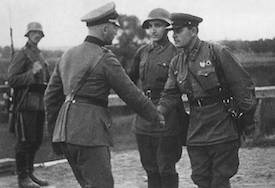 German and Soviet troops meet at Brest-Litovsk and together stage a military review. An agreement is signed affirming their common border lines in eastern Poland. The 26th night attack in succession on London. The first of the recently purchased US destroyers arrive in Britain. 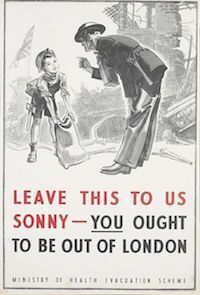 Britain renews call to evacuate mothers and children from London (489,000 evacuated by October 17). Uruguay cracks down on Nazi infiltrators, expels 13 German spies. A Soviet-British-US conference opens in Moscow to discuss western aid to Russia. Lord Beaverbrook represents Britain and Averell Harriman the USA. Free French declare independence of Syria and Lebanon. Japanese assault city of Changsha, China, beginning Second Battle of Changsha. Ted Williams of Boston Red Sox earns .406 batting average for season; record still stands. The US Navy Department claim 42 Japanese aircraft shot down in the Solomon Islands in last three days, with no US losses. Germans anti-partisan forces retake Split from Tito’s partisans. An agreement between Tito and Stalin is reached in Moscow, which allows the Red Army to enter Yugoslavia. The Red Army begin an offensive towards the Yugoslav border from Romania. Greek Resistance groups agree to unite under Allied leadership. The United States Office of Censorship is disbanded.